Lock in a great price for Hotel Abril - rated 8.3 by recent guests. Comfy beds, friendly staff. Good location. Good selection of nearby cafes & restaurants. Very clean. Excellent location. Helpful staff. Free coffee. We liked th situation of the hotel and bering in a silent street, and in the center of town. Once you know where you are you visit most by walking. The Alcazar and the piazza d'Espagna. Small hotel with very friendly staff. Very quite while I was there. The internet is okay but was unable to do a VC call from this location. This hotel has heating which was appreciated during winter nights which can be called in non-heated building in Spain. Would go back without any problem. Great location, easy to find as it's right next to one of the main landmarks in Seville. Great wifi. Very clean. Friendly check in staff who had time to draw on a map to show where I should visit to make the most of my stay. Everything was perfect. Friendly staff, wonderful breakfast, clean rooms with a bathtub in the bathroom. Good value for the money. Definitely would recommend. Friendly reception, comfortable and quiet room, clean. The breakfast spread was also good. Friendly Helpful Staff .- good breakfast offer and substantial breakfast by Spanish standards. - though given the late night hours kept in Seville we didn't make breakfast very often. Coffee and biscuits available free during day. 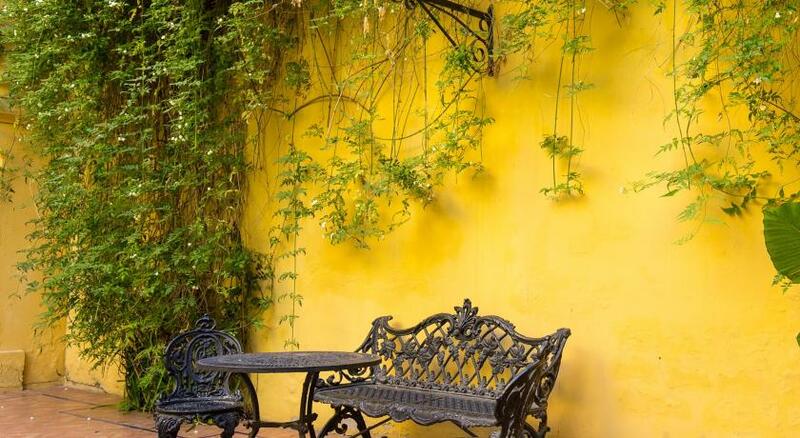 This value-for-money hotel is in the historical and monumental centre of Seville. It has a free all-day coffee shop service and free Wi-Fi. The Abril Hotel is in a typical Sevillan house in a central setting. It is by the Plaza de la Encarnación, metres from many shopping streets. The Abril is a short walk from the Cathedral and the Giralda. The Jewish Quarter and the Alcázar are also within walking distance. The hotel's coffee shop offers free coffee, tea, hot chocolate, and biscuits. Guided visits around Seville and other cities and flamenco shows can be organized from the hotel's tour desk. All rooms at Abril Hotel are traditional and en suite. They all have satellite TV and a free safety deposit box. There is full heating and air conditioning. Hotel Abril has been welcoming Booking.com guests since 10 Nov 2005. When would you like to stay at Hotel Abril? Includes a free self-service coffee shop, newspaper, tourist magazine, city maps, amenities and complimentary use of the safety deposit box. This smaller room has a minibar. Includes a free self-service coffee shop, newspaper, tourist magazine, city maps, amenities and complimentary use of the safety deposit box. This room type has 4 single beds and an en-suite bathroom. Free Wi-Fi is available. We arrange your visits to sightseeing tours or even to other cities. Flamenco shows can be also booked at reception and, of course, you can ask all the information you need about Seville. House rules Hotel Abril takes special requests - add in the next step! Hotel Abril accepts these cards and reserves the right to temporarily hold an amount prior to arrival. City street noise as not used to it (late noise from bars in street & early morning stock deliveries to supermarket opposite). Glad I packed the earplugs! The breakfast is basic and offers low quality products. Local spanish products would have been nice to have. Room not super clean (dust below the beds). The hotel is very near the old center of the town and from a taxi stop. Very quiet. Free coffee and tea all day long. Nice people at the desk. A little supermarket is located in front of the hotel and is open from 9am till 9pm ! Wonderful, quiet location within easy walking distance to sights, restaurants, cafes and stores. Room and bathroom were large and clean; bed was very comfy! Staff very accommodating and speak English. Very good breakfast, too! Quiet "internet" room with good wifi for guests use. Would stay here again! Breakfast was fine, its hard to go wrong with bread, cheese and ham. However, it was pre-packed supermarket croissants and pastries and tinned fruit only the melon was fresht. Didn't like the fact the room had no windows, and the lightbulbs were quite dim, so the room felt quite gloomy, although I visited in winter, and I imagine in the middle of summer being able to escape the hot sunshine would be quite welcomed! The room was very comfortable with a chair and a small desk. There were 2 French doors to open to let in light but it may be they gave us a triple room upgrade as there was another twin bed. The beds were comfortable but twin beds instead of a double. The bathroom was good sized as well as the shower. The wifi fast, reliable and easy to connect to. The staff were super nice and helpful. The breakfast was included in rate but even at 5 Euro is a good deal with coffee, ham, cheese, and fresh fruit. There was a coffee carafe with good coffee and coffee pod machine which made good espressos. Right across the street is grocery store where you can get beverages and snacks for mini-fridge in the room. The grocery store also has a fresh orange squeeze machine so a ½ liter of fresh orange juice is 1.70. The hotel is central for easy and pleasant 13 minute walk to the cathedral and palace on pedestrian only streets. I highly recommend this hotel for location, comfort, staff, and value. The breakfast place was a bit small - I had to wait for 10 mins to wait for a seat.